Micheal Rasmussen, the lost chicken. The “whereabouts” problem continues. Where am I? I need food. It appears to be a recurring problem. The Chicken has trouble with his whereabouts. 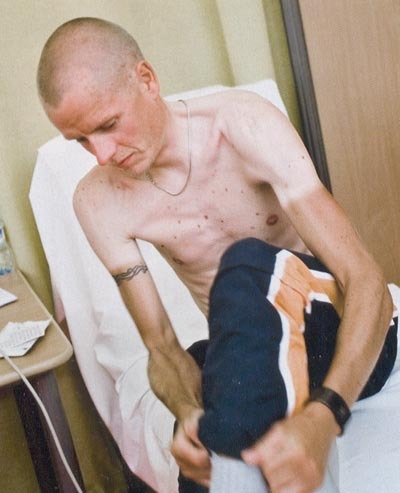 First he was booted out of the 2007 Tour De France with the maillot jaune still on his back for lying about his whereabouts to the anti-doping authorities. He’d claimed to be in Mexico but was in fact training in Italy. His Rabobank team immediately sacked him. After his two year enforced vacation, Rasmussen is still having difficulties with whereabouts. He simply never seems to know where he’s going or where he will be. Perhaps it’s a side effect of the EPO drug — the inability to focus on place, a defined geographical location. A thickening of the blood accompanied by a congealing of the thought processes. On the verge of signing a contract with the CDC-Cavaliere team, the Dane broke what he called only a “pre-contract.” This was accompanied by the hilarious phrase, ” The two parties have commenced the liquidation of the cooperation that has never existed.” Rasmussen hinted that he’d soon sign with a bigger, more exciting team within days but then nothing but silence. Chicken, no coop. Now, with the 2010 ProTour season kicking off with the Tour Down Under in a matter of days, nobody seems to know where Rasmussen will end up — especially Rasmussen himself. The emaciated climber would seem like a natural fit for a team with adjustable ethics and no internal drug testing program. Yet, surprisingly, the answer seems to be no. It hasn’t helped that news stories continually link him with an Austrian doping operation and name him as the co-owner, along with disgraced rider Bernard Kohl, of a blood centrifuge. “I don’t hear Michael’s name mentioned in my international network talks about changes in the riders’ market,” Sorensen said. “Maybe it’s because of the case from Austria, still buzzing from the authorities, and therefore scaring away interested teams.” Yeah, that’s a solid rationale. Is there no home for a chicken, even an unrepentant one? Where is Michael Rasmussen at this moment? Perhaps at Danilo di Luca’s house. Always a warm welcome there. « Armstrong has “feel good” feeling for Tour Down Under. That’s good.